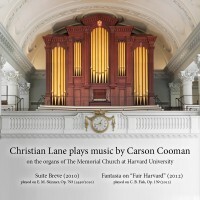 Fantasia on “Fair Harvard” (2012) for organ was composed for the Baccalaureate and Senior Chapel services at The Memorial Church, Harvard University, in celebration of the C. B. Fisk, op. 139 (2012) organ—the Charles B. Fisk and Peter J. Gomes Memorial Organ. All the musical material for the work is derived (almost obsessively) from the university’s alma mater, Fair Harvard (lyrics by Samuel Gilman; tune from a traditional Irish air). The tune is heard both straightforwardly and in transformation, and all the accompanying motives are derived from phrases of the melody.